Fitbit’s had a rocky history with smartwatches. It wet its feet with the Surge in 2015, which followed up with the Blaze. Then there was last year’s Ionic, featuring the new FitbitOS designed with the help of Pebble’s team – its first ‘proper’ smartwatch. They were all solid devices for particular users, but none convinced me they were worth buying over a simpler fitness tracker or a more powerful smartwatch like the Apple Watch or an Android Wear device. The $199 Fitbit Versa changes that. It starts with the design. Fitbit finally realized its macho-blocky designs just don’t have broad appeal. Even though the Versa and Ionic have nearly identical features (more on this in a bit), the Versa’s curvier, far smaller design is something I suspect many more people will be comfortable wearing. It feels like a smartwatch designed for regular people – not just techies or fitness addicts. It looks like a smaller Apple Watch, but one that’s not tied to a single platform. Fitbit’s also made no secret it’s marketing the Versa more heavily at women – female health tracking was announced along with the Versa’s release, although it’ll also be available on the Ionic. But really, I think anyone who doesn’t want a watch that looks like a mini-calculator from the 80s would appreciate the shift. I’m particularly fond of the rose gold model – my review unit is sporting a dark blue strap for a sweet color contrast, and this time around, you can use your own straps too (22mm). When it comes to features, I could largely copy and past the text from my Fitbit Ionic review. The heart rate tracking was consistently on point when compared to manually counting my pulse, even during short bursts of intense activity. It’s one of the most accurate I’ve tested in this regard. The screen is plenty bright enough to read in the mid-day sun. The blood oxygenation (SP02) sensor is still not being used for anything. There are only a few areas the Versa loses to the Ionic. For one, it doesn’t have GPS built-in. This only really matters if you want to go on a run without your phone, which I’m willing to bet most people don’t do. Second, in the US, the Versa doesn’t come with NFC payments at its $199 price tag. You’ll have to pay 30 bucks extra for that feature, though at least Fitbit throws in a nifty woven band for the price. Still, it seems an odd omission when the rest of the world has access to NFC by default. Fitbit’s reasoning is that contactless payments haven’t taken off in the US like in other parts of the world, but it still feels like an unecessary complication. The actual ‘smart’ part of this watch is just okay, though things have improved since I first reviewed the Ionic. Fitbit has plenty more watchfaces and apps available, though few enough you can see them all with quick scroll through the app store. These are largely centered around fitness, and for those which aren’t, functionality is pretty basic, as the device can’t integrate with phones as deeply as an Apple Watch or Android Wear OS device. Notifications, for instance, are super basic, though Fitbit will launch a quick-reply feature for Android users in May. But those complaints are mostly aimed at the techie crowd. For most people, who I suspect mainly care about design, battery life, and basic smart functionality, the Versa hits the right notes. The UI and animations also aren’t as sleeks as on competing smartwatches, for instance, but those smartwatches don’t have the Versa’s longevity: I found Fitbit’s claim of 4+ days to be right on the money. Fitbit OS is showing signs of life, and given I expect the Versa will be Fitbit’s most successful gadget in a smartwatch form-factor yet, developers may have more incentive to create apps for the OS. I still think Fitbit would’ve been better off just tacking features onto the late Pebble OS, but the fact remains the Versa is a good-looking smartwatch and excellent fitness tracker at a very reasonable price. Where I think the Ionic is too expensive($300) to be worth it over the Charge 2 ($150) or a comparable Android or Apple device, the Versa hits a sweet spot. 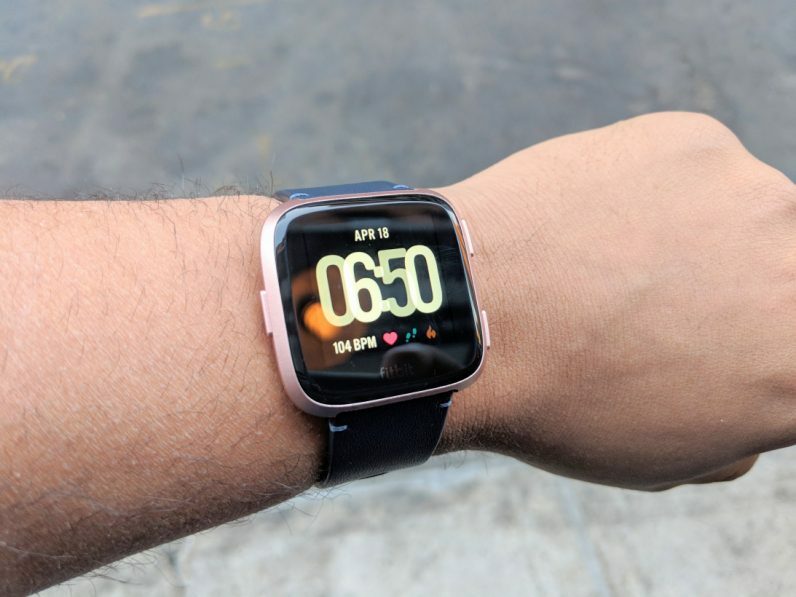 If you don’t need the most advanced smartwatch features – which, let’s face it, most people don’t – the Fitbit Versa an easy recommendation at $199.